The abundant use of fresh herbs in Vietnam cooking and cuisine one of the most striking observations we made while traveling through the country. Used generously, in almost every meal, raw herbs are torn, tossed, rolled and wrapped into everything from soups, rice and noodle dishes, sandwiches and more. 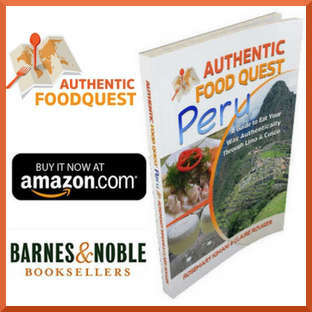 The herbs are exotic and go beyond the typical basil, tarragon or parsley you easily find in other parts of the world. Herbs like knotgrass, pepper elder, fish mint, rice paddy herb, to name a few, intrigued and surprised us. To better understand the elements of Vietnamese cuisine, we decided to take a Saigon cooking class at The Vietnam Cookery Center. 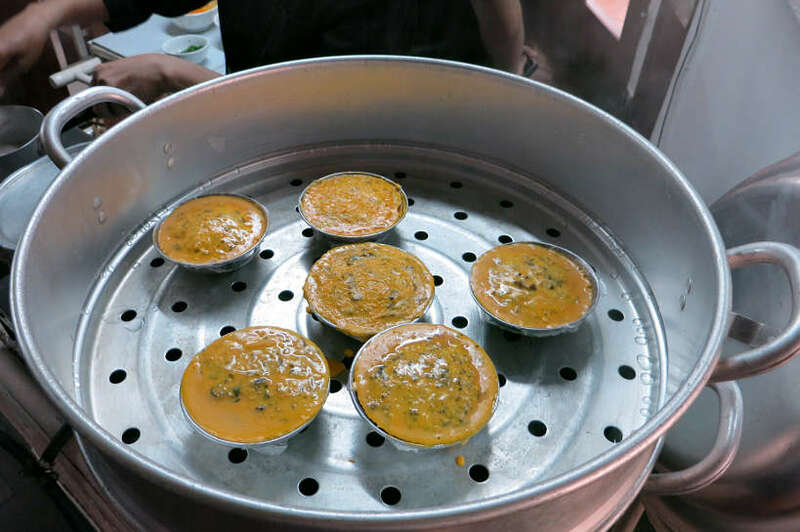 Join us and let’s go behind the scenes of traditional Vietnamese cooking in Saigon. Built in 1999, The Vietnam Cookery Center is actually the first cooking center in Vietnam. 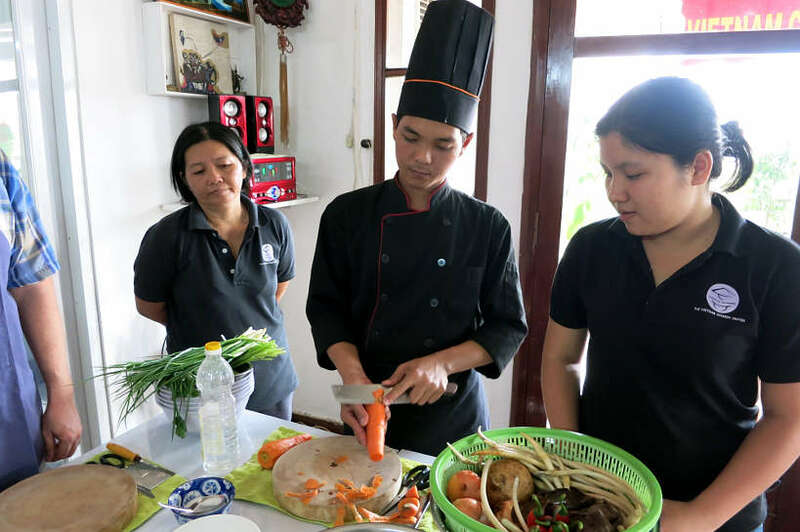 Unlike most cooking schools, this center offers both classes for tourists and professional chefs. 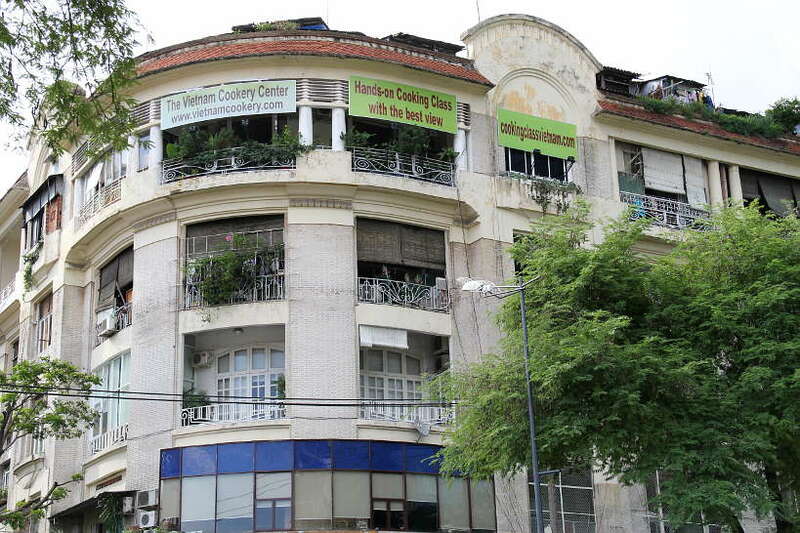 Located in the core of Saigon, The Vietnam Cookery Center is by itself a remarkable historic building. 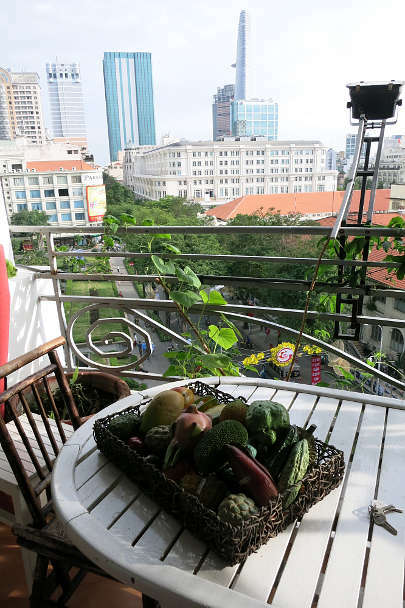 It was built in 1930 by the French and is one of the last colonial building developed in downtown Saigon. The funny part of the story is that the building was supposed to be for the Saigonese Elite. As the first concrete building in Asia, the French architect made a cultural mistake. He built the building like in France where the space under the roof was divided into small rooms for the servants. Well, in Asia, the tradition is to worship the Gods over your head, not the servants. 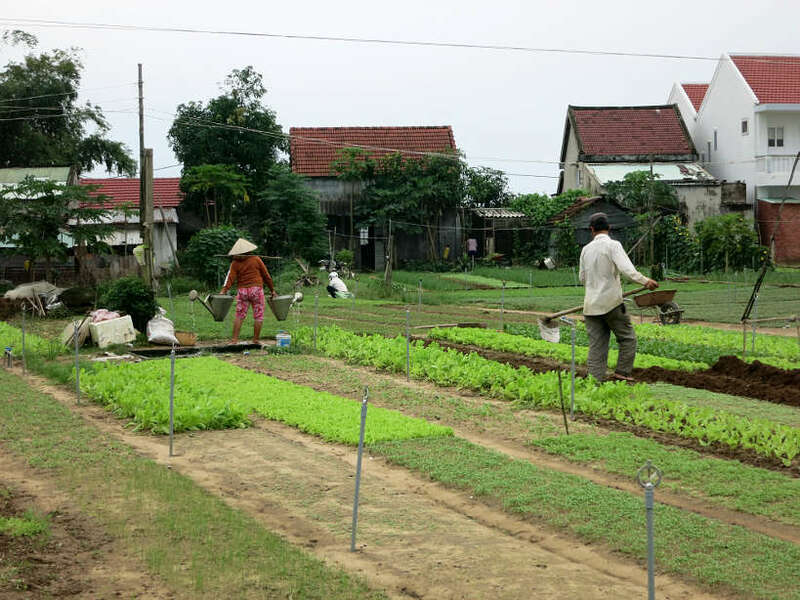 As a result, none of the rich Vietnamese accepted to live there. Situated on the top floor of the building, the Vietnam Cookery Center has a very nice large terrace where we cooked part of our dishes. It also offers a splendid view of the local area called the “Golden Triangle.” This was the perfect place to create our Vietnamese dishes. The Vietnam Cookery Center offers a variety of cooking classes in Saigon for tourist and professionals alike. For tourists, they have classes everyday morning and afternoon. In the mornings, you have the choice to take a market visit as well. We chose an afternoon class on a Saturday, where we had read that classes are less crowded making it more intimate. Indeed, on that day we were only 5 people taking the class. They also offer extended programs with up to 3 cooking classes for Saigon residents. And for professional chefs, they have in-depth courses. Both of these programs are one-on-one private cooking classes. The transformation of raw ingredients into a plated feast is what makes taking a cooking class so immersive and fun. In this cooking class in Saigon, the Vietnamese chef did not speak English and all instructions were translated by a guide. The approach is hands-on and helpful staff prepare and pre-measure the ingredients. Individual cooking stations are provided and all the cooking utensils and ingredients neatly laid out. With the following multi- course menu to prepare, we were in for a treat! 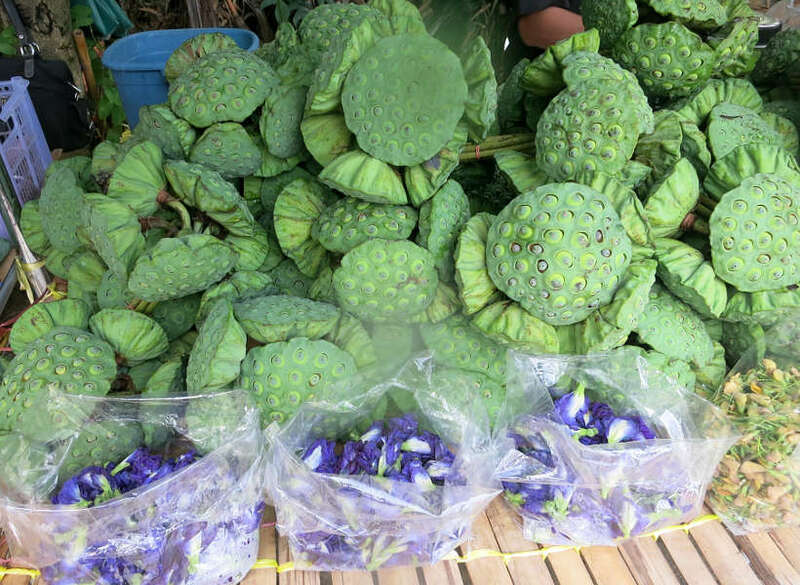 After having seen lotus flowers at many local markets, we were excited and looking forward to cooking with and tasting the stems. We began by cleaning, chopping and cutting the lotus stems, carrots and chili into julienne strips. Into a bowl, we tossed in shrimps and pieces of pork tenderloin that had been boiled and marinated into a sauce made of lemon juice, vinegar, fish sauce and more. Once everything was well mixed together, we transferred the salad onto a plate. The salad was garnished with fried peanuts, shallots and and a chili flower on the top. Interesting and delicious is how we would describe the salad. The unusual flavors with the fish sauce, pork ,and chilies made for a difficult to describe combination of tastes. The lotus stems were crunchy in texture and any distinctive taste was overpowered by the fish sauce and other ingredients. On the whole, a tasty and unique salad. 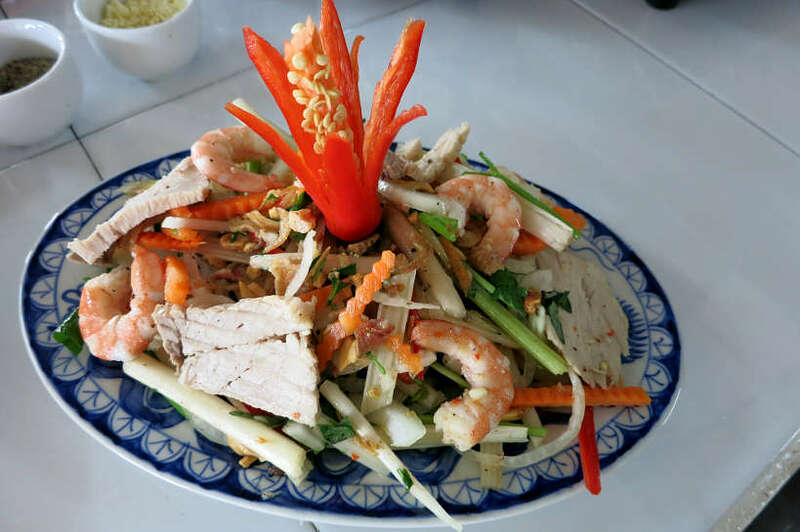 Download the recipe for Lotus Stem Salad with Pork and Shrimp Recipe from The Vietnam Cookery Center. Rice in Vietnam is the basis of all meals. There are dozens of varieties of rice and they differ slightly not only in taste but also in texture, color, aroma, and gluten content. Cơm Tấm is a popular Vietnamese dish made from broken rice which is fragments of rice grains. These rice grains have been broken either in the field during drying, transport or by milling. It is as nutritious as unbroken rice and has nothing wrong with it. However, broken rice is said to better absorb flavors and has a softer texture. Broken rice was the preferred choice for poorer Vietnamese as it is less expensive. But today, it is now a popular ingredient of choice by chefs and used in many recipes. 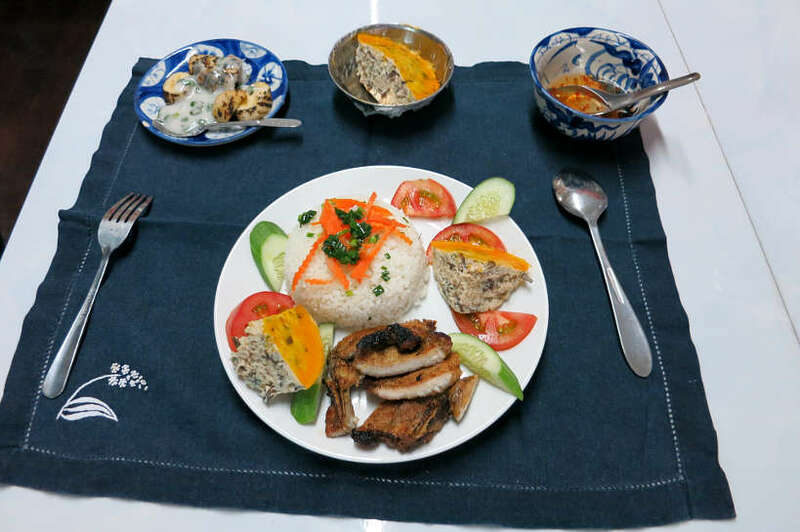 We really enjoyed our first dish of broken rice when we were in Da Nang (Central Vietnam) and we were curious to learn more about it in our cooking class. Broken rice actually cooks faster than unbroken rice, and the amount of water needed should be equal to the amount of rice, no more! With rice, the other major staple in Vietnamese cuisine is the Nuoc Mam or fish sauce. It is used in practically all Vietnamese Dishes. It is made from the juice of fermented salty fish. The darker the sauce the “purer” and more expensive the sauce. We personally love Nuoc Mam or fish sauce and cook with it regularly. 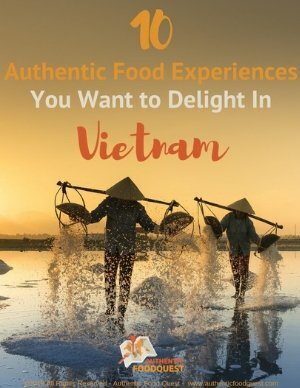 It does have a strong smell that might be off-putting to some, but it is a must for those wanting to savor authentic Vietnamese cooking. We used it here as a dipping sauce for our meal. Vietnamese typically eat broken rice with pork chop, shredded pork or a pork loaf. At the Saigon cooking class, we made grilled pork chops. After marinated the pork chops for 10-15mins in a shallot and soy sauce based preparation, we put our pork chops on the charcoal grill outdoors. After the pork chops turned golden brown in color, it was time to prepare our final plate. In addition to the pork chops, we added cooked broken rice, slices of tomatoes, cucumbers, and oiled-scallions. Download the recipe for Grilled Pork Chops with Cooked Broken Rice from The Vietnam Cookery Center. To complete our meal, we made steamed pork pies. This surprising pie was made with duck eggs and stuffed with minced pork, mushroom and glass noodles. After mixing all the ingredients together, we placed the mixture into a bowl for steaming. The result was a pleasant surprise! Visually, very attractive with a smooth golden top created as a result of basting it with egg yolk. And the taste surprised us. The pie was very light and quite flavorful with the shallots and spring onions. A really delightful pie. Download the recipe for Steamed Pork Pie with Mushrooms and Glass Noodles from The Vietnam Cookery Center. We enjoyed a truly exceptional meal bursting with flavors. A delicious reward from all the hard work after cooking the different courses. The perfect end to a fun Saigon cooking class! Delicious feast with everything we prepared! Eating is one of the highlights of any visit to Vietnam. 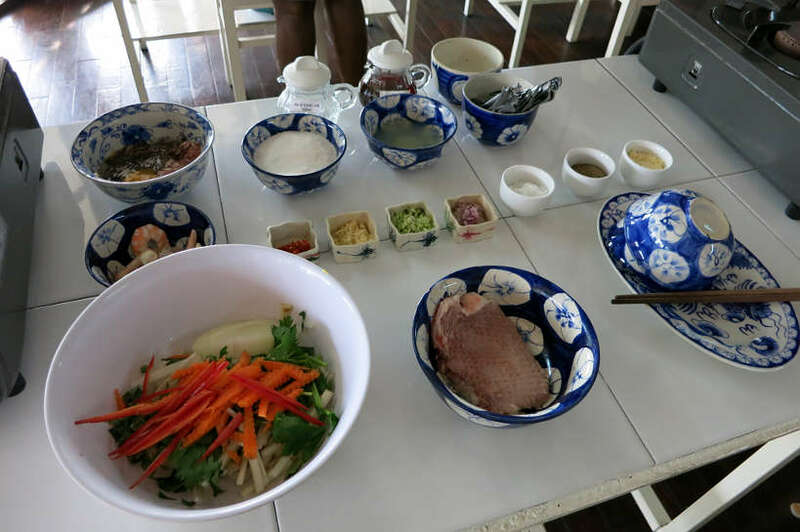 Taking a Saigon cooking class is a great way to engage all your senses and get a deeper understanding of the local culture. This immersive experience gives you the opportunity to learn more about the food and unfamiliar herbs and ingredients. 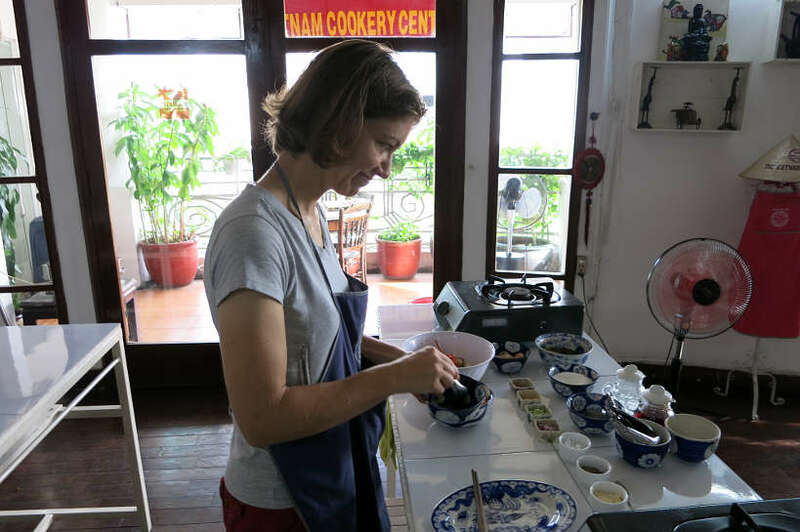 In a fabulous airy space with high ceilings and great views, taking a cooking class at The Vietnam Cookery Center offers a wonderful introduction to Vietnamese cuisine. 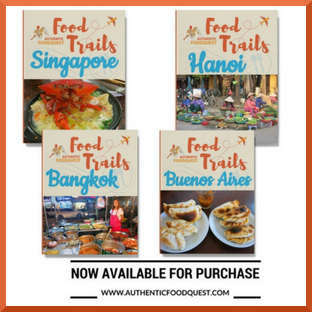 Learn about the different Vietnamese sauces, spices, herbs and cooking techniques in a personalized setting. 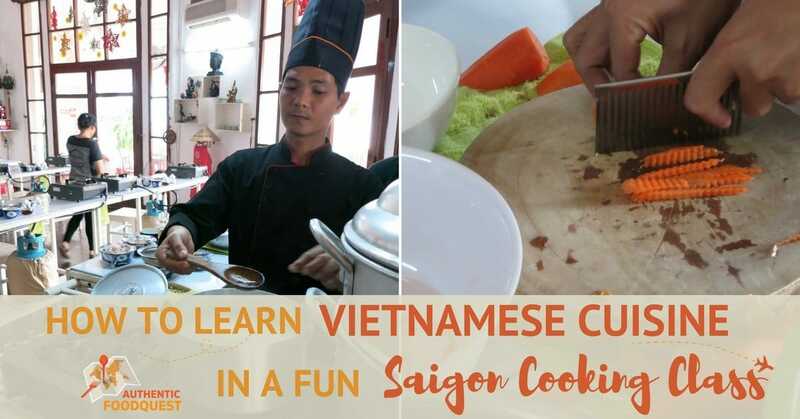 If your travel plans take you to Ho Chi Minh City, don’t hesitate to learn about Vietnamese cuisine in a fun Saigon cooking class. Additionally, if Hoi An in Central Vietnam is one of your stops, consider a Hoi An cooking class as well. 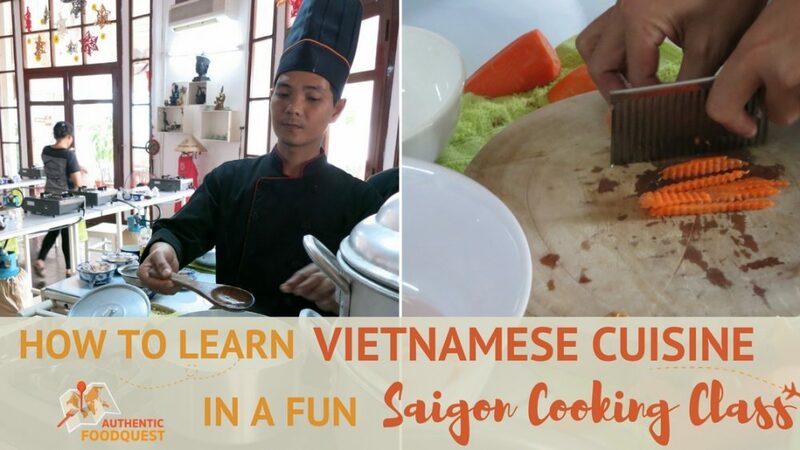 Book your cooking class directly at the Vietnam Cookery Center. I’m really looking forward to doing a cooking class one day in my travels. This one looks like an excellent choice. Indeed, if you are ever in Saigon, we highly recommend taking this cooking class. A wonderful experience and much fun!! Thanks so much. I LOVE cooking and baking and a cooking class like this I would be so excited!! I wish I could do this! As one that loves cooking, this class would be up right your alley. You get to learn new ingredients and techniques and a recipe book with instructions on how to make them at home. Do check out the The Vietnam Cookery Center if your travels take you to Vietnam. Thanks for stopping by. Great post! 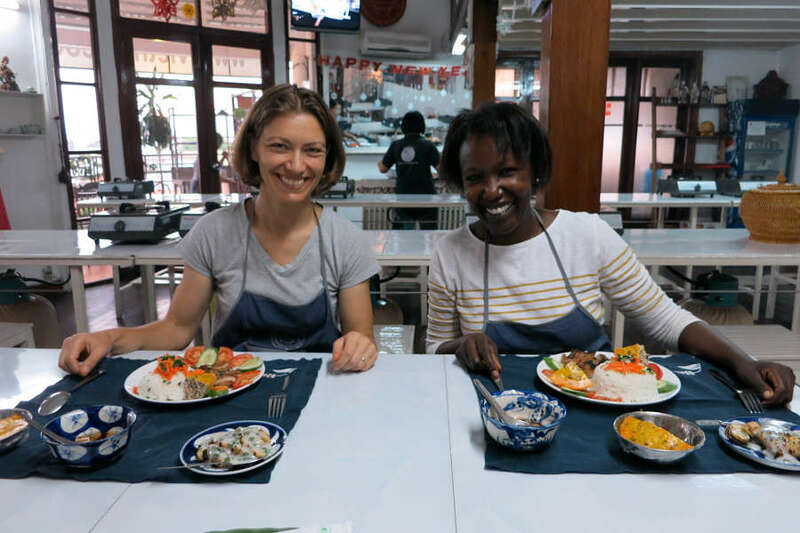 I took a cooking class in Bali that was very similar (located at the family’s temple, lots of hands-on instruction, plenty of delicious food). Now when I travel abroad, I always try to take a cooking class or two in each country I visit. 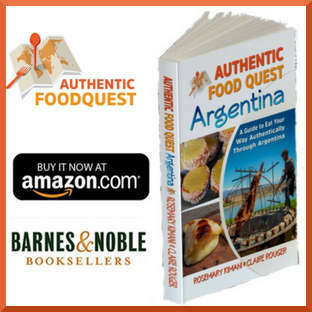 That’s awesome to read that you enjoy taking cooking classes on your travels. Where was the last cooking class you took? Loads of fun and a great way to go deeper on the culture. Appreciate your comments. This sounds like a lot of fun! 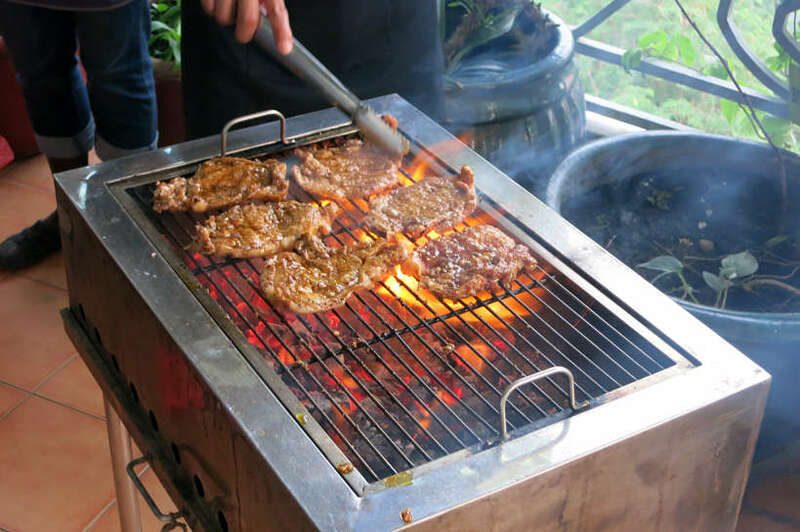 How exciting to experience new recipes and cooking methods in Vietnam! Thanks for sharing- enjoyed the post. So glad you enjoyed the post, Rhonda. Do let us know if you end up making one of the dishes. Thanks for stopping by. I’ve never really tried any Vietnamese food myself. I would like to though and this experience sounds fantastic! Vietnamese cuisine is truly amazing and delicious. Do check out a Vietnamese restaurant in your area to give it a try. It is absolutely worth th experience. 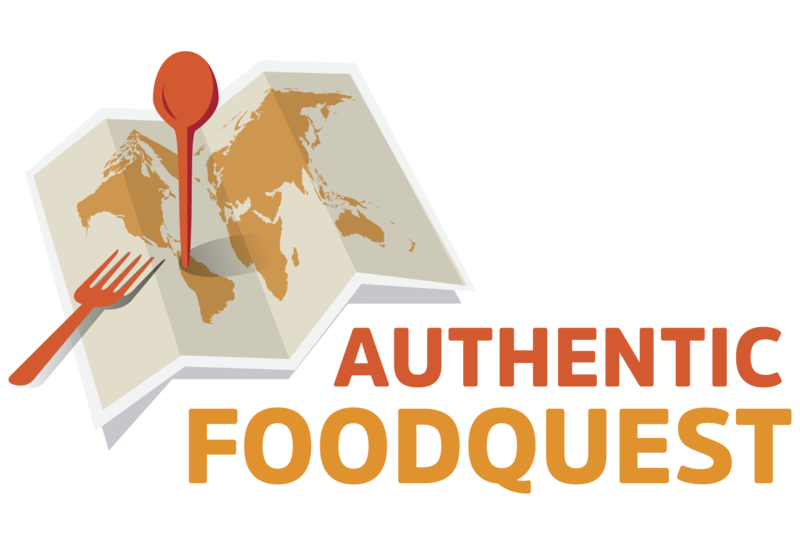 Let is know what and where you try the cuisine locally. Cheers. We love Vietnamese cuisine and my daughter loves to cook. This would be a great activity for families too! That’s wonderful to read Amanda. Please do let us know what you end making as a family!! Cheers. This looks great. I would really like to learn more about Vietnamese cuisine and the ingredients they use. You are right Stephanie, one of the best parts of taking the cooking class was getting to learn more about Vietnamese herbs and ingredients. Highly recommend the Vietnam Cookery Center if you travels take you to Saigon. Thanks for stopping by. This cooking class sounds incredible! Thank you for sharing your culinary adventures with us. 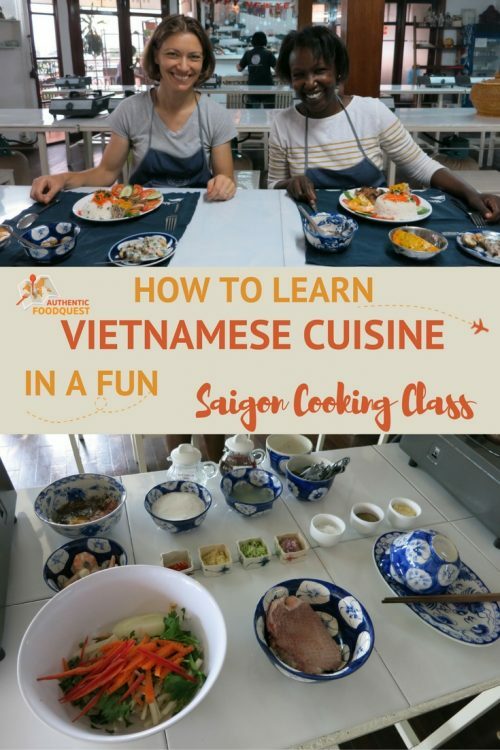 I would absolutely LOVE to participate in a Vietnamese cooking class, and I am adding it to my bucket list. =) While traveling in Thailand and Indonesia, I took Balinese, Javanese, and Thai cooking courses, and they were life changing! 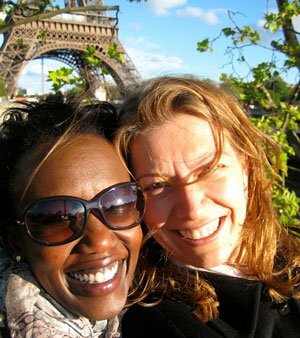 I adore your blog, your quest to discover and share local cuisine. Cheers! Thank you so much Aarika for your feedback on our blog and article about the cooking class in Saigon. We really appreciate it. 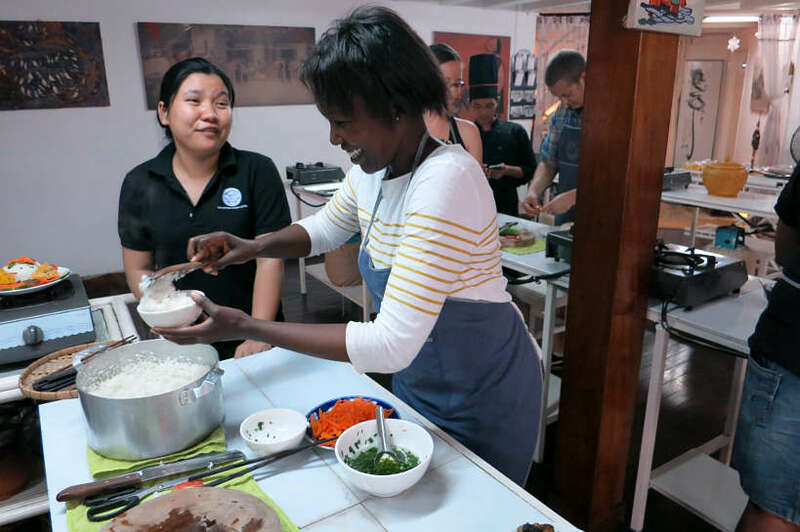 Cooking classes are a wonderful way to learn more about a local culture. I hope you make it to Vietnam soon and take the class for yourself. Thanks again. Cheers!! It looks like a feast and a fun way to spend a day. How wonderful that you got to try all those herbs and learn what they are. It’s the salad that really spoke to me. Yummy! I am definitely adding this to my list of things to do when we get to Saigon. Love the story about the building, and lucky for the cooking school. I think cooking classes are the best way to get to know a local culture the quickest. There’s something about food that shows the culture and history of a place. When I get to Vietnam, I’ll look into this place in Saigon. That’s wonderful to hear Leah and we totally agree. Food is a way to a culture and cooking it helps you appreciate it even more. Definitively do check out the class when you get to Saigon.